Definition at line 37 of file builder.cc. Definition at line 72 of file builder.cc. Definition at line 75 of file builder.cc. Definition at line 94 of file builder.cc. Definition at line 103 of file builder.cc. Definition at line 41 of file builder.cc. Definition at line 108 of file builder.cc. References blockStack_, fncDecl_, fncDef_, and hasError_. Definition at line 118 of file builder.cc. References VarSet::add(), createVar(), Var::defined, StreamDecorator::E_ERROR, StreamDecorator::E_NOTE, Vm::fileName, hasError_, Token::lineno, and vm_. Definition at line 133 of file builder.cc. 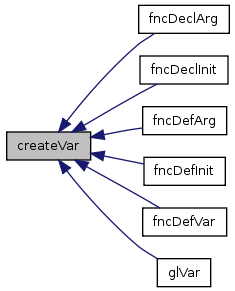 References createVar(), StreamDecorator::E_WARNING, Vm::fileName, fncDecl_, and vm_. Definition at line 147 of file builder.cc. References VarSet::add(), FncDeclaration::args, createVar(), StreamDecorator::E_WARNING, Vm::fileName, fncDecl_, and vm_. Definition at line 159 of file builder.cc. References FncSet::addDeclaration(), Var::defined, StreamDecorator::E_ERROR, StreamDecorator::E_NOTE, Vm::fileName, fncDecl_, FncSet::getDeclaration(), hasError_, Token::lineno, FncDeclaration::self, and vm_. Definition at line 177 of file builder.cc. References createVar(), StreamDecorator::E_WARNING, Vm::fileName, fncDef_, and vm_. Definition at line 191 of file builder.cc. References VarSet::add(), FncDeclaration::args, createVar(), Var::defined, StreamDecorator::E_ERROR, StreamDecorator::E_NOTE, StreamDecorator::E_WARNING, Vm::fileName, fncDef_, hasError_, Token::lineno, Var::name, FncDeclaration::self, and vm_. Definition at line 218 of file builder.cc. References VarSet::add(), FncDeclaration::args, createVar(), Var::defined, StreamDecorator::E_ERROR, StreamDecorator::E_NOTE, StreamDecorator::E_WARNING, Vm::fileName, fncDef_, hasError_, Token::lineno, Var::name, FncDeclaration::self, FncDefinition::vars, and vm_. Definition at line 256 of file builder.cc. References FncSet::addDeclaration(), blockStack_, FncDefinition::cmdList, Var::defined, StreamDecorator::E_ERROR, StreamDecorator::E_NOTE, StreamDecorator::E_WARNING, Vm::fileName, fncDef_, FncSet::getDeclaration(), FncSet::getDefinition(), hasError_, Token::lineno, FncDeclaration::self, and vm_. Definition at line 293 of file builder.cc. 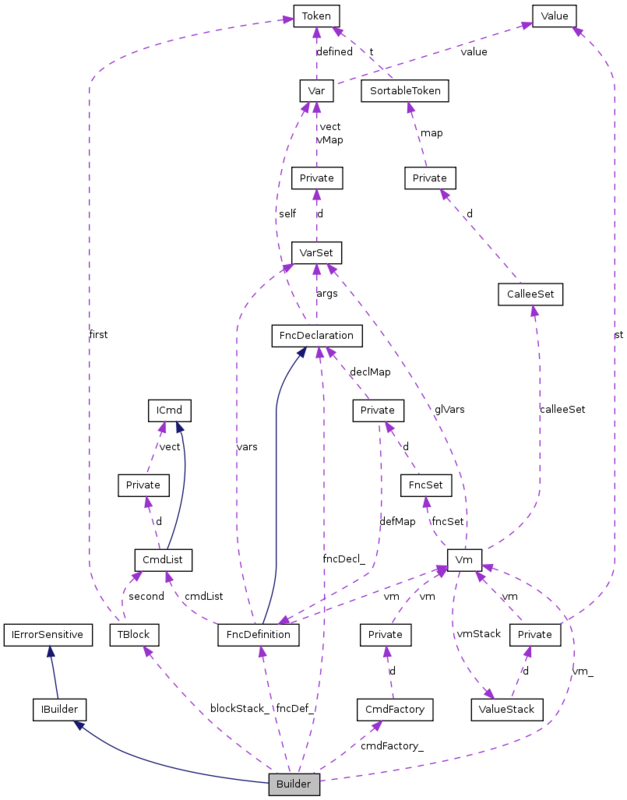 References FncSet::addDefinition(), blockStack_, chkBlockStack(), Var::defined, StreamDecorator::E_ERROR, StreamDecorator::E_WARNING, Vm::fileName, fncDef_, hasError_, FncDeclaration::self, and vm_. Definition at line 312 of file builder.cc. References appendCmd(), chkTypeOnTop(), cmdFactory_, CmdFactory::createAssign(), StreamDecorator::E_WARNING, Vm::fileName, fncDef_, and vm_. Definition at line 322 of file builder.cc. References blockStack_, chkTypeOnTop(), and Value::V_BOOL. Definition at line 328 of file builder.cc. References blockStack_, chkBlockStack(), and Builder::TBlock::first. Definition at line 337 of file builder.cc. 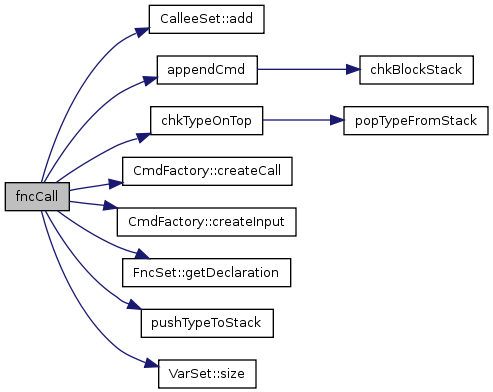 References appendCmd(), blockStack_, chkBlockStack(), cmdFactory_, CmdFactory::createIf(), Builder::TBlock::first, and Builder::TBlock::second. Definition at line 357 of file builder.cc. Definition at line 362 of file builder.cc. Definition at line 371 of file builder.cc. References appendCmd(), blockStack_, chkBlockStack(), cmdFactory_, CmdFactory::createWhile(), Builder::TBlock::first, and Builder::TBlock::second. Definition at line 391 of file builder.cc. References appendCmd(), cmdFactory_, CmdFactory::createPush(), StreamDecorator::E_WARNING, Vm::fileName, fncDef_, pushTypeToStack(), and vm_. Definition at line 401 of file builder.cc. References appendCmd(), cmdFactory_, CmdFactory::createUnary(), StreamDecorator::E_ERROR, StreamDecorator::E_NOTE, ETOKEN_KW_NOT, ETOKEN_OP_MINUS, Vm::fileName, hasError_, popTypeFromStack(), pushTypeToStack(), Token::type, Value::V_BOOL, Value::V_DOUBLE, Value::V_INT, and vm_. Definition at line 415 of file builder.cc. References appendCmd(), cmdFactory_, CmdFactory::createBinary(), StreamDecorator::E_ERROR, StreamDecorator::E_NOTE, Vm::fileName, hasError_, popTypeFromStack(), pushTypeToStack(), Value::V_NULL, and vm_. Definition at line 430 of file builder.cc. References CalleeSet::add(), appendCmd(), FncDeclaration::args, Vm::calleeSet, chkTypeOnTop(), cmdFactory_, CmdFactory::createCall(), CmdFactory::createInput(), Var::defined, StreamDecorator::E_ERROR, StreamDecorator::E_NOTE, StreamDecorator::E_WARNING, Vm::fileName, Vm::fncSet, FncSet::getDeclaration(), hasError_, Token::lineno, pushTypeToStack(), FncDeclaration::self, VarSet::size(), Value::type, Value::V_DOUBLE, Value::V_INT, Value::V_STRING, Var::value, and vm_. Definition at line 482 of file builder.cc. References appendCmd(), chkTypeOnTop(), cmdFactory_, and CmdFactory::createPrint(). Definition at line 488 of file builder.cc. References StreamDecorator::E_WARNING, ETOKEN_KW_DOUBLE, ETOKEN_KW_INT, ETOKEN_KW_STRING, ETOKEN_KW_VOID, Vm::fileName, Value::V_DOUBLE, Value::V_INT, Value::V_NULL, Value::V_STRING, and vm_. Referenced by fncDeclArg(), fncDeclInit(), fncDefArg(), fncDefInit(), fncDefVar(), and glVar(). Definition at line 507 of file builder.cc. References blockStack_, chkBlockStack(), hasError_, and Builder::TBlock::second. 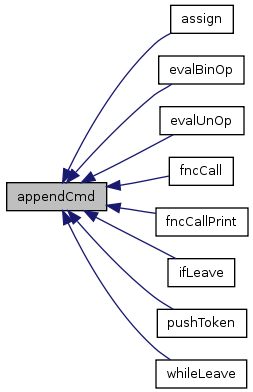 Referenced by assign(), evalBinOp(), evalUnOp(), fncCall(), fncCallPrint(), ifLeave(), pushToken(), and whileLeave(). Definition at line 519 of file builder.cc. References blockStack_, Var::defined, StreamDecorator::E_WARNING, Vm::fileName, fncDef_, FncDeclaration::self, and vm_. Referenced by appendCmd(), fncDef(), ifElse(), ifLeave(), whileEnter(), and whileLeave(). Definition at line 526 of file builder.cc. References StreamDecorator::C_LIGHT_CYAN, StreamDecorator::C_NO_COLOR, and typeStack_. Referenced by evalBinOp(), evalUnOp(), fncCall(), and pushToken(). Definition at line 533 of file builder.cc. References StreamDecorator::C_LIGHT_CYAN, StreamDecorator::C_NO_COLOR, StreamDecorator::E_WARNING, Vm::fileName, typeStack_, Value::V_NULL, and vm_. Referenced by chkTypeOnTop(), evalBinOp(), and evalUnOp(). Definition at line 547 of file builder.cc. References StreamDecorator::E_ERROR, StreamDecorator::E_NOTE, Vm::fileName, hasError_, popTypeFromStack(), and vm_. 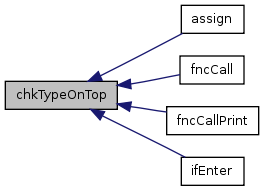 Referenced by assign(), fncCall(), fncCallPrint(), and ifEnter(). Definition at line 65 of file builder.cc. 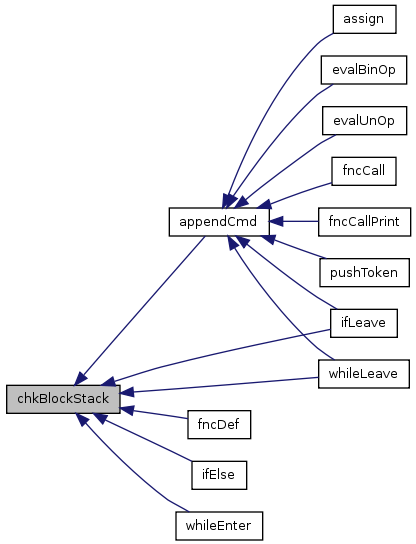 Referenced by assign(), chkBlockStack(), chkTypeOnTop(), createVar(), evalBinOp(), evalUnOp(), fncCall(), fncDecl(), fncDeclArg(), fncDeclInit(), fncDef(), fncDefArg(), fncDefBody(), fncDefInit(), fncDefVar(), glVar(), popTypeFromStack(), and pushToken(). Definition at line 66 of file builder.cc. Referenced by appendCmd(), chkTypeOnTop(), errorDetected(), evalBinOp(), evalUnOp(), fncCall(), fncDecl(), fncDef(), fncDefArg(), fncDefBody(), fncDefVar(), glVar(), and hasError(). Definition at line 67 of file builder.cc. Referenced by errorDetected(), fncDecl(), fncDeclArg(), fncDeclInit(), and ~Builder(). Definition at line 68 of file builder.cc. Referenced by assign(), chkBlockStack(), errorDetected(), fncDef(), fncDefArg(), fncDefBody(), fncDefInit(), fncDefVar(), pushToken(), and ~Builder(). Definition at line 69 of file builder.cc. Definition at line 73 of file builder.cc. Referenced by appendCmd(), chkBlockStack(), errorDetected(), fncDef(), fncDefBody(), ifElse(), ifEnter(), ifLeave(), whileEnter(), whileInit(), and whileLeave(). Definition at line 76 of file builder.cc. 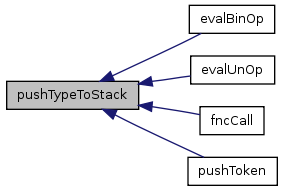 Referenced by popTypeFromStack(), and pushTypeToStack().